I’ve had Star Wars on the brain lately. My fanaticism normally cycles like a washing machine through: comics, Doctor Who, Star Wars, Star Trek, and then starts over again with comics. Seems like I’ve been firmly in the Star Wars spin cycle for a while now. I’m nearly finished with the ninth novel in the Star Wars: Legacy of the Force series. I’ve been reading recent issues of Dark Horse’s Star Wars Legacy comic. And I’ve been thoroughly enjoying the Two True Freaks Monthly Monday Star Wars podcasts. 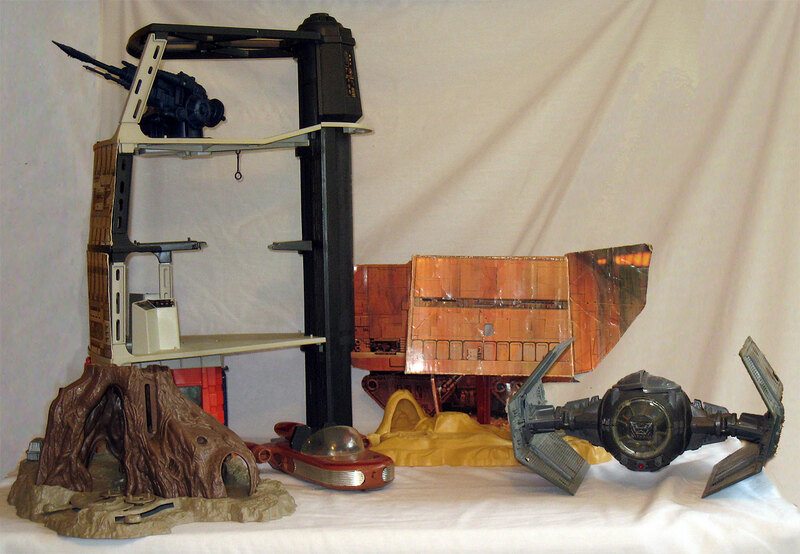 With all this Star Wars in my brain, I thought I’d do a week of posts displaying some of my Star Wars collection – we’ll call it my Star Wars Resume. This past weekend I went up in the attic and dug out my vintage Star Wars action figures. 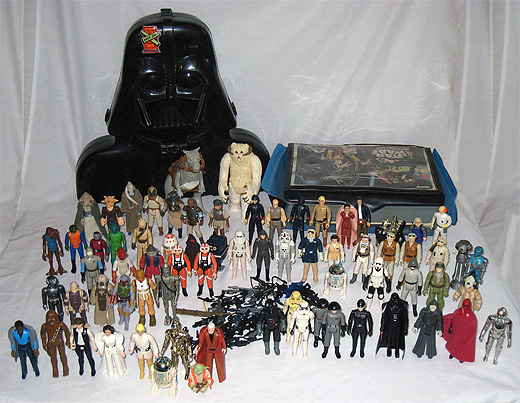 Growing up I had every Star Wars action figure released through The Empire Strikes Back. I picked up quite a few of the Return of the Jedi figures, but that was about the time I started losing interest in the toys. In the late 1990s I started buying some of the newer Star Wars figures. Primarily I focused on figures that didn’t have a corresponding toy in the original Kenner line (like Biggs and the Sandtrooper). I’ve got about 50 of those figures, but I’m not going to display them here since they’re fairly recent by comparison. My step-son also has about 50 of the Star Wars Galactic Heroes figures which are lots of fun and super cute. For the photo below I was too lazy to match each and every gun with the appropriate figure (though I can probably still do it from memory), so the weapons are all in one big pile. Click the image to enlarge. If memory serves, the really jaundiced Stormtrooper was the victim of a sandbox Sarlacc pit. Below you’ll find my remaining vehicles and playsets. I used to have the Creature Cantina Action Playset, but I must have pitched it at some point. Interestingly, the base from the Land of the Jawas Action Playset below was reused two more times by Kenner. They used the same mold with white plastic to create the Hoth Ice Planet Adventure Set and the Rebel Command Center Adventure Set. The coolest of my remaining vehicles and playsets has to be the Death Star Space Station. It was friggin’ huge and provided hours of entertainment and adventures. I’m pretty impressed with myself for not losing the tiny pieces all these years (i.e. the swinging rope). Click the image to enlarge. If you are a fan of the vintage Star Wars figures, then I highly recommend Star Wars: The Action Figure Archive. This book was produced in 1999 and covers every Star Wars action figure, vehicle, and playset produced from 1977 – 1997. It’s very informative and has over 2,000 gorgeous pictures. It’s not in print anymore, but you should be able to pick up a copy used. Definitely worth your effort. For my Star Wars Resume this week I’ll also cover my novels, comics, and RPGs. Below are some things I don’t have time to feature this week, but have contributed to my Star Wars fandom over the years. This certainly isn’t a complete list, but it includes some items that come to mind immediately. Four different copies of the first three films – Original video release, 1995 video release, 2004 DVD Special Edition release, and the 2006 DVD Special Edition release that contained the original theatrical versions. Star Wars Holiday Special (1978) – so painful to watch nowadays, even for a geek like me. Other things that come to mind are: tons of trading cards, Happy Meal-style toys, posters, mousepads, kid’s books, drinking glasses & dinnerware, and so on. I’m sure I’m forgetting about a zillion things. While my house isn’t covered in Star Wars paraphenalia, there certainly is a bunch of it lying around. Check back here the rest of this week for my continuing Star Wars Resume. Consider me jealous. I wish my attic was as cool as yours! I had plenty of Star Wars figures when I was a kid, but my older brother convinced me to sell them so we could buy snow-cones at the pool all summer. Sigh. Those are excellent. My husband has most of the Star Wars lego sets, and someday we hope to set them all out somewhere. I have to admit that I’m pretty jealous of your vintage figure collection. I had a few of the classic figures from back in the day, but I didn’t have anything comparable to this. My brother was born in 1978 and I was born in 1980, so we had pretty much every SW figure through Return of the Jedi and some of that line which came right it (Power of the Force, I think?). My father, being the forward-thinking guy that he is, actually bought two of every one of the original line, and kept the seconds on the cards. And yeah, they are still sitting in the attic. I personally always dug the Executor playset which had Darth Vader’s meditation chamber. Great playset! And the Death Star set had the awesome GARBAGE COMPACTOR accessory with the foam garbage! My thanks to everyone for the comments! CJ – I’ve got a particular weakness for Snow Cones, so that doesn’t sound like a horrible trade to me. Luke – I hate you. Pure unadulterated hatred. … okay, that’s not true. =P I’m just insanely jealous of your father’s foresight. That is so freakin’ awesome! FREAKIN’ AWESOME! … p.s. Still hate you. These photos make me cry. In a good way. Shag, can I come over and play with your jawa sand crawler? Seriously . . . I want to play with that thing. My brain hangs up on those exact same subject matters too, though not in that order. (YES, I think I have an order, isn’t that vweird?) NOW you have to do a resume on Doctor Who and Star Trek too! Kaiser – Y’know, I’ve been working through a Doctor Who resume in my head. Unfortunately, I’m not sure how many readers would be interested. Well I’d be interested obviously. Probably more so than Star Wars, just because a Doctor Who resume would seem like a more rare and difficult feet, especially for an American. This puts my episode 1 figure collection (NIB, by the way) to shame. By the way, I don’t display them – I keep them hidden in the attic out of shame.